Although it has been a little over a month since the passing of Donny R. Guillemette ’00, the Saint Anselm community still remembers his life during and beyond his years at the College. Donny was born in Sanford, Maine on November 27, 1976, and grew up in Weare, New Hampshire. He entered the College in 1996, from which he received his Bachelor’s degree in Sociology. Later in his life, he received his Master’s degree from Rivier College in Nashua, New Hampshire. He served as the Executive Director of the Caregivers, as well as the Director of Service Learning at Rivier College. Dan Forbes, Director of Service Education from the Meelia Center for Community Engagement, gave the eulogy for Donny at his service. The Crier reached out to Forbes for the eulogy and has printed it below as a way for current students, faculty, and staff, to remember the life of one of their fellow Anselmians. Earlier this week the campus and community came together to mourn the death of Donny Guillemette, class of 2000. He was a man filled with positive energy and determined to put himself to good use. I was Donny’s colleague throughout his college years, and I witnessed the care he took with everyone; the students he managed, his campus collaborators and with so many people in the community. For years I have been using of my earliest memory of Donny as an example of student leadership at our new staff trainings. I hired Donny at the Center for Volunteers (now the Meelia Center) shortly after he arrived on campus in fall of 1996. Only half of my time was directed at the volunteer center then, and we’d seen a steady steady growth in the number of volunteers, service-learners and student staff the center supported. The strain on our capacity to manage all of this work was evident to Donny. In early October of his freshman year, about a month after joining us, Donny came bounding into the office one morning to announce that he woke up in the night thinking about the center, and had developed a strategy that would help us to better track students who were engaged in the community. I knew at that moment that Donny would become the first Student Assistant Director, as the college was not ready to create a professional position yet. He started the work then, but I waited to formally announce his new position until he started his sophomore year. I was not sure how the juniors or seniors on staff would feel, taking direction and receiving support from a first-semester freshman. In the end, I really had nothing to worry about. Donny had a gentle management style that empowered those around him. He was so creative and resourceful that we all trusted him. His passion to make us a stronger organization soon fueled our own ideas and energy to make the volunteer center an even greater force. As a junior, Donny and a team of students went off to a national conference for campus service leaders. Not surprisingly Donny returned all fired up and said that he’d spoken with the conference organizers to see if Saint Anselm could host the conference the following year. He and the entire team begged me to consider it. 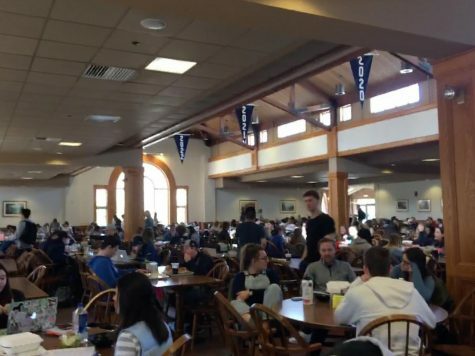 I might have been more nervous, except I was convinced that the college would never agree to the idea of hosting 2000 student leaders from all over the country just as Saint Anselm students headed off for spring break. So I said that if the college agreed to it, I would support his bid to host the conference. I should have known better. Donny was incredibly persuasive, and because of his impact over three years, the center was running more smoothly than it ever had. The college agreed to host the campus outreach conference, and I was about to journey with this young powerhouse on one of the busiest years the center had experienced to date. Anyone who ever worked with Donny will not be surprised that the national COOL Conference 2000 was the most successful ever. Under Donny’s inspiring leadership, Meelia’s student staff managed their usual community engagement work, kept up with their studies, and planned and managed all of the tasks associated with a national conference. Local hotels, bussing companies, food and sound vendors, etc. must have marveled at the professionalism of this student team. The extra communication and coordination with all of our campus departments, from dining and campus security staff to senior administrators, actually strengthened our relationships on campus. I am convinced that the Princeton Review designation of Saint Anselm as one of the nation’s “Colleges with a Conscience” was in part linked to Donny’s dream to put us on the national map. Donny’s first job after leaving Saint Anselm was the director of Caregivers, a program to help senior citizens remain in their homes. He immediately expanded the range of services and the reach of the program to address unmet needs of the seniors in Manchester and Nashua. Many faculty, students and staff at the college have volunteered with the Caring Cupboard, an elderly food delivery which he created at Caregivers. In addition to that work, Donny also managed service-learning at Rivier University and was the vice chair of the school board in Weare, NH. It is now clear that Donny struggled at the end of his life, but none of that defines him. The work that he accomplished, the lives that he touched, and the children that he and his wife Jen (class of 2000) lovingly raised has already defined him. Donny was a man who lived a life of meaning, who shared love and accepted the love of others, and most importantly he was a husband and father who devoted himself to his beautiful family. Nothing can change the Donny Guillemette that we know; was a truly great person, and we will miss him and cherish his memory. thank you for your kind words at my Brothers funeral. your words meant so much to our family. God bless you my friend.